This P-38J Droop Snoot is a new addition to Dragon,s 1:72 Golden Wings series. 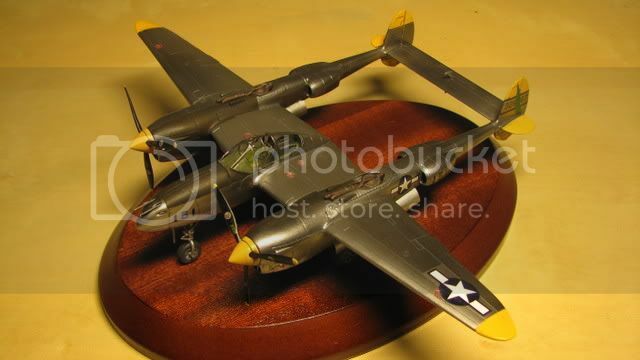 Based around the previous P-38J kit it will make an interesting addition to fans of the Lightning’s collections. One of the many versions of the P-38 Lightning was that of a Bombing Formation Leader. This became known as the “Droop Snoot”. The idea is attributed to Colonels Cass Hough and Dan Ostrander who were based at the 8th USAAF’s engineering section in Hertfordshire England. In mid-late 1943 the 8th USAAF was suffering terrible losses to Luftwaffe fighters and Flak. They realised that the P38's payload was approaching that of the B17 and began looking into the possibility of using P-38s as fast bombers, using a “master bomber” fitted with the top secret and highly accurate Norden bombsight. These converted P-38Js were to lead formations of P-38Ls with a payload of 4000lbs. After bombing the target the P38s could then fly back to their bases as fighters, using their faster speed and greater manoeuvrability to avoid the German defences. Additionally, only 2 men were at risk in a Droop Snoot and 1 in each P-38L, compared to ten in a B17. Work began converting a P38J at Langford Lodge in Ireland during January 1944. The nose was cut back and all armaments were removed. The rebuilt nose consisted of a couch for the bombardier, who was to remain prone throughout the flight, a Norden bombsight, a pexiglass nose and small side windows. The modified P38-J, (42-681184) was tested on an RAF bombing range and the results were satisfactory. The amount of Droop Snoots built is unknown. One reference I found points to around 90 in total, another to 23 factory built and about 100 conversion sets being manufactured and shipped for “in the field” modification. Normal armament for the Droop Snoots was one 2000lb bomb, and the first missions were flown in April 1944 with good results. On opening the box you’ll find 3 plastic bags containing 4 sprues of parts, with an additional bag containing the extras for the “droop snoot” and its decals. The instructions and painting guide are in the usual Dragon format. Clear exploded diagrams should present no problems when assembling the model. The parts are generally very cleanly moulded in grey plastic with no trace of flash, apart from those on sprue A which will require a small amount of cleaning up. Any sink marks are small and in placed in areas that won't be visible when the model is assembled apart from small ones on the inside of the main undercarriage doors. The kit is the standard Dragon P38J with some additional parts to create the “droop snoot”. 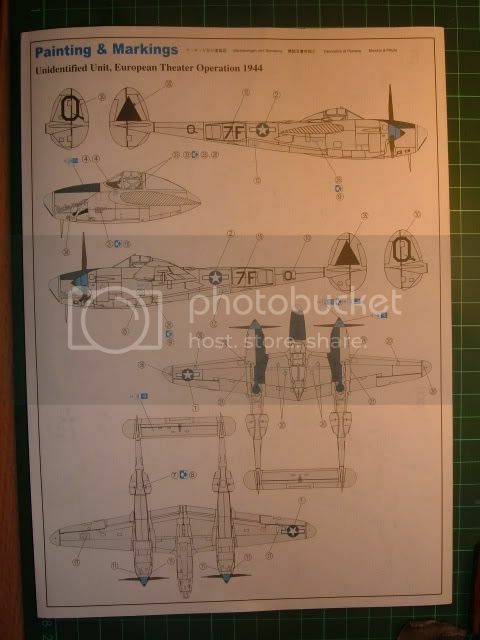 These consist of a new mould of the Lightning’s contra rotating propellers, a perspex nose, and a small fret of photo etch parts to create the Norden bombsight. You also get PE seatbelts and elevator mass balances. The latter are also included in the normal plastic parts list and are more accurate shape that the PE offerings. A small amount of surgery will be required to fit the new nose but this is highlighted in the relevant section of the instructions. Options are included in the kit. A P38 based in the Europe 1944 and marked as being from an unidentified unit, and secondly markings for the personal aircraft of General George Stratemeyer, commander of the Army Air Forces in the China Theatre from April 1944 to March 1946. There are plenty of photos of Droop Snoots operating in the ETO and if the modeller wanted to depict a specific aircraft or unit this would be quite easy to do. The decals include a full factory stencil set and are well printed and in register. 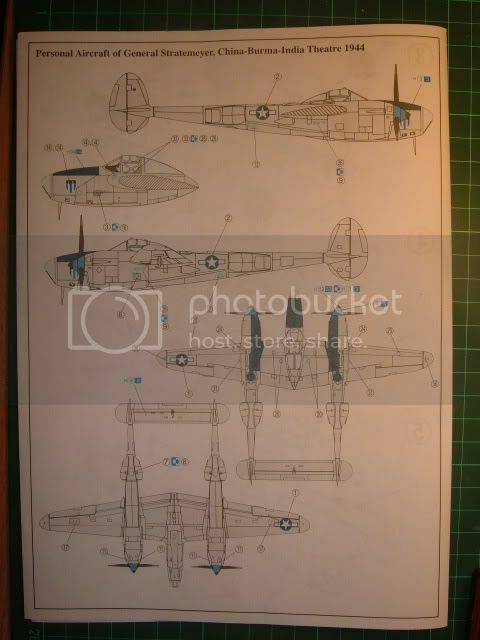 Offering the wing and fuselage sections up to the 1:72 plans I have the measurements look spot on. The panel lines and details are finely engraved and look nicely in scale. However, Dragon have failed to include the side windows that were added to the nose of the “Droop Snoot” version of the P38, (although the box art clearly shows them) and this is a shame. But for that omission this kit would be getting full marks for accuracy from me. As a P38J this is a very nice model. As a “droop snoot” its not quite there because of the lack of side nose windows. So its not going to please the rivet counters out there. However, if like myself you’re not overly concerned by that and want to add a different version of the P38 to go with your collection then you're going to like it. Personally, I'm looking forward to building it. Don’t forget to add some ballast in the nose section or you’ll end up with a “tail sitter”. Highs: Excellent detail.Nice decal options. An interesting version of the Lightning to add to a collection of American aircraft of WW2.. Lows: Because of the lack of side windows in the nose it falls short on accuracy. Some cleaning up of parts required and the small amount of surgery involved may put off the young or inexperienced modeller. Verdict: A very accurate representation of a P38-J. Excellent detail and panel lines.Should build up into a fine model. Thanks Nige. I appreciate it. I might go for this one to try some NMF. Seems like a good bird to start with. Lovely looking P-38. You're right about the NMF and the yellow complimenting one another. I'd say you've done a terrific job and the fact it's only a 1/72 scale makes it even more impressive.